Lisa C. Ravensbergen and Thomas Hauff in God and the Indian. Photo by Ed Maruyama. For a country that prides itself on the multicultural mosaic on which it was built, Canadian history is peppered with unspeakable acts of racism; the Chinese head tax, the internment of Japanese during World War II, and the residential school program are all examples of institutional racism that has permeated our society over the years. It is the latter of these that is explored in Drew Hayden Taylor’s powerful God and the Indian, and features one of the finest performances you are going to see all year on a Vancouver stage. A vital piece of Canadian theatre, God and the Indian is a reminder of one of our country’s darkest secrets. More importantly though, like the Truth and Reconciliation Commission, it is also a path forward. 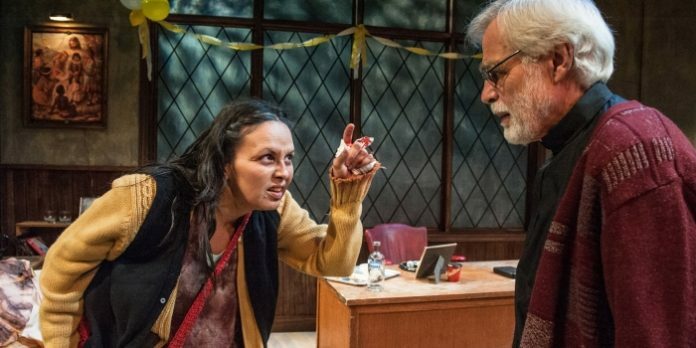 In God and the Indian, panhandler Johnny Indian, whose real name is only revealed late in the play, recognizes and confronts the newly appointed Anglican Assistant Bishop George King, accusing him of sexually abusing her while under his care. For the next 80 minutes, the two perform an uncomfortable dance of accusations and recriminations that brings to the forefront some of the horrific acts many of the children suffered by those entrusted with their care. In Taylor’s play, we are never quite sure Johnny’s true nature. Is she meant to be a composite of all the children who suffered at the residential schools, is she recounting her own story, or does she perhaps simply reside in the tortured memories of King? Rather than being unfocused though, Taylor’s structure allows God and the Indian to operate on its three levels as a representation of the work of the Residential Schools Truth and Reconciliation Commission (TRC): to create a historical account of the residential schools, to help with healing, and encourage reconciliation. It is not by mere coincidence that the TRC will wrap-up the day after God and the Indian closes in Vancouver. Things do get somewhat repetitive as Johnny and King find themselves playing a badminton game of accusations and denial, but thanks to Lisa C. Ravensbergen’s powerful performance as Johnny, this sometimes forgotten history lesson is elevated to the extraordinary. Ravensbergen heaps so many years of abuse, alcoholism and life on the street onto her performance, it is any wonder she isn’t crushed by its weight. But despite a deteriorating body, she is whip smart, delivering the playwright’s wisecracks with skill. There are many moments of heartbreak and grief as she talks of her brother Sammy and life as a residential school resident. Her description of receiving oranges as a child doesn’t need the visual as you can almost taste and smell them. On the flipside is the man she accuses of helping to perpetrate some of the unspeakable acts. Unfortunately, Thomas Hauff as King is no match for Ravensbergen’s performance, finding little variety and even less subtlety in his delivery. By the time King makes an admission to help diffuse the growing tension in his office, there has been little in the way of build-up to this potentially shocking release. Laughlin Johnston’s set is gorgeously realized, with the walls of King’s office becoming transparent through the use of scrims to reveal a hazy representation of some of Johnny’s memories. God and the Indian by Drew Hayden Taylor. A Firehall Arts Centre production in association with Native Earth Performing Arts. On stage at the Firehall Arts Centre (280 E Cordova St, Vancouver) until May 30. Visit http://firehallartscentre.ca for tickets and information.